Eleven major fires in California but Anthony Watts at WUWT sez "it's not happening"! While there are currently eleven major fires raging in California, eleven in Oregon and four in Washington state, Anthony Watts decides to go to "it's not happening" (archived here). With more than half of his home state in extreme drought and in the midst of the fire season, it takes an extreme denialist to try to argue that climate change isn't real. And it takes a person of dubious morals to try to convince his readers that "it's not happening". Here is a chart with US fire data from the National Interagency Fire Centre. As always, click to enlarge. The data go back to 1960. However there is a warning about data prior to 1983. Prior to 1983, sources of these figures are not known, or cannot be confirmed, and were not derived from the current situation reporting process. As a result the figures above prior to 1983 shouldn't be compared to later data. So with that in mind, I've only plotted the data from 1983 to 2013. The period probably isn't long enough to draw solid conclusions, but it's suggestive of a trend to bigger fires and perhaps a small increase in the overall number of fires. (Note the very low count in the first year or two, which would distort the linear trend for the number of fires making it appear steeper.) This is against a background of much improved fire suppression technology, communication etc. So if all else was equal, I'd have expected that the area burnt would lessen. It hasn't. If anything it's increased over the years. Anthony's article didn't actually make any comparison - so his headline doesn't mean anything. 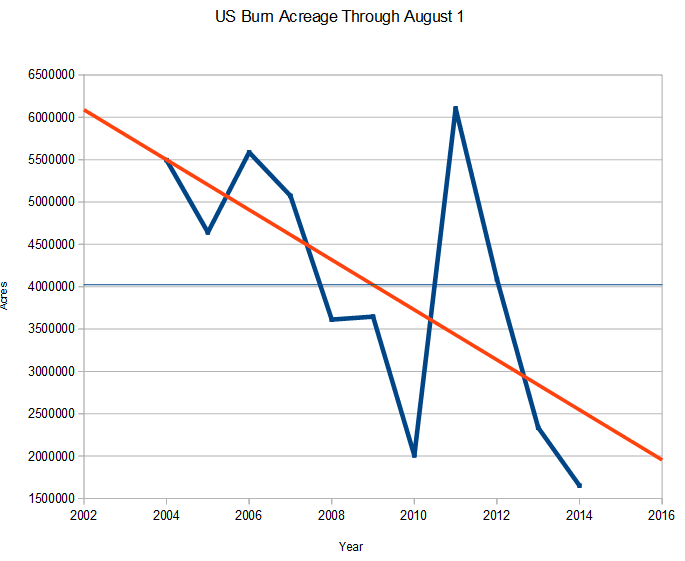 There is no information other than the chart came via Tony Heller aka "Steve Goddard" and it purports to be the acreage burnt for each year up until August 1. The website currently shows comparable data through to 5 August. I've also plotted the number of fires reported. However, it does look as if Anthony and Tony could have given a fuller picture of the situation. Compare the data to 5 August with that for the whole year (up top). 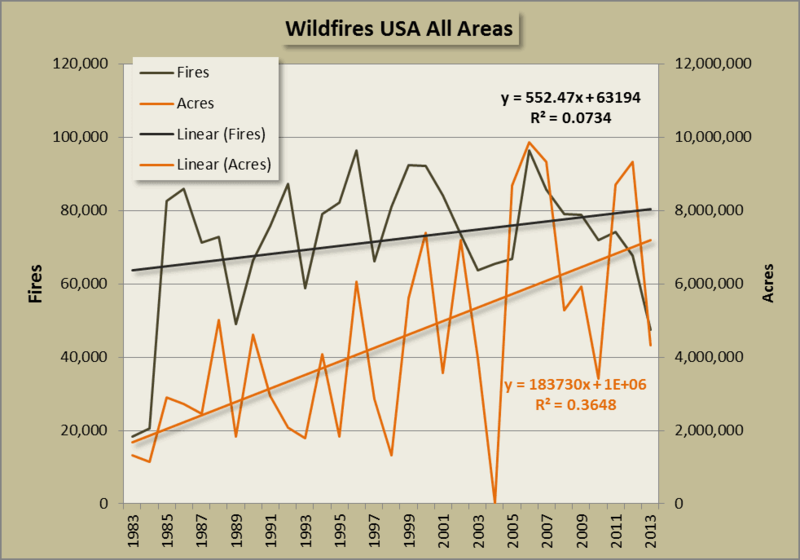 The bottom chart suggests fires may be reducing over time. 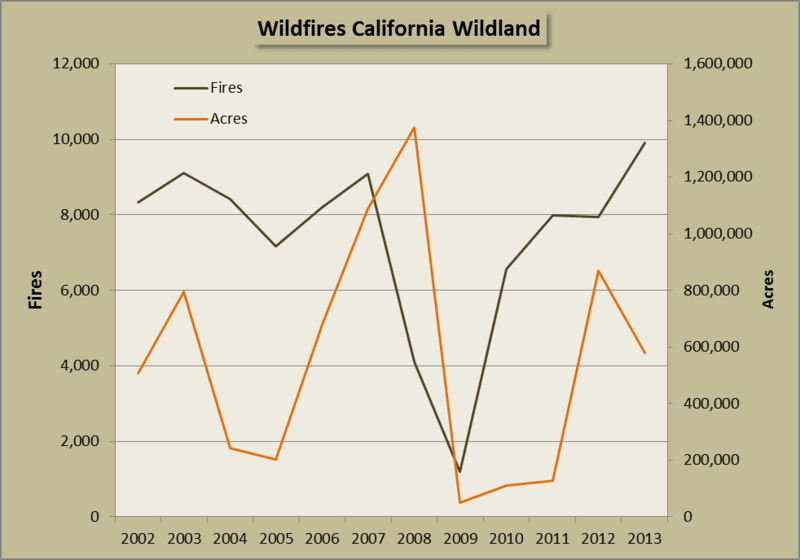 The full year charts suggest that fires are getting bigger over time. One could ask the question, are fires starting later each year. 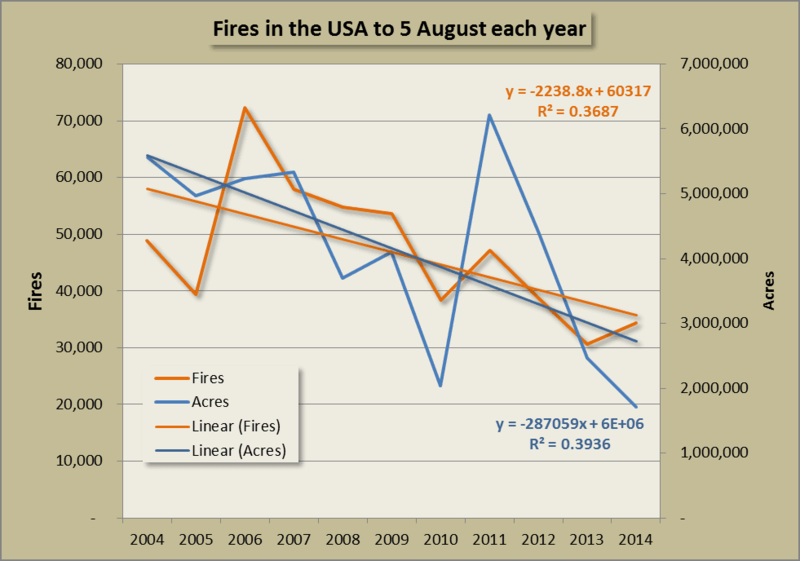 Is the fire season shifting? Or are firefighters getting on top of fires that start earlier in the season? The data only goes back to 2002 so it's hard to base any conclusions on it. Here is a chart for wildfires in California. I don't think there is much room for complacency for Californians like Anthony. Though if he lives safely in the suburbs he might be okay. Anthony Watts' article was mainly a cut and paste of something on the website of the USDA Forest Service Southern Research Station. It was letting people know there is a special section on US fires in the latest edition of the journal Forest Ecology and Management. I'm not sure why Anthony Watts posted a link to the article. His readers don't, as a rule, read scientific journals. Most of them don't even follow links from WUWT. The article doesn't give out much information itself. It's a promo for the journal. It looks as if there are some worthy articles in the special issue, but I'd take a guess that most readers will be Forest Ecology and Management subscribers. Separately each of the six articles about fire costs $US35.95, which will put off people like myself who have limited funds to spend on journal articles. That's more than a year's subscription to Science. Wimberly, Michael C., and Zhihua Liu. "Interactions of climate, fire, and management in future forests of the Pacific Northwest." Forest Ecology and Management (2013). DOI: 10.1016/j.foreco.2013.09.043 Click for the full abstract. The diverse forest types of the southwestern US are inseparable from fire. Across climate zones in California, Nevada, Arizona, and New Mexico, fire suppression has left many forest types out of sync with their historic fire regimes. As a result, high fuel loads place them at risk of severe fire, particularly as fire activity increases due to climate change. A legacy of fire exclusion coupled with a warming climate has led to increasingly large and severe wildfires in many southwest forest types. Climate change projections include an extended fire season length due to earlier snowmelt and a general drying trend due to rising temperatures. This suggests the future will be warmer and drier regardless of changes in precipitation. Hotter, drier conditions are likely to increase forest flammability, at least initially. Changes in climate alone have the potential to alter the distribution of vegetation types within the region, and climate-driven shifts in vegetation distribution are likely to be accelerated when coupled with stand-replacing fire. Hurteau, Matthew D., John B. Bradford, Peter Z. Fulé, Alan H. Taylor, and Katherine L. Martin. "Climate change, fire management, and ecological services in the southwestern US." Forest Ecology and Management (2013) DOI: 10.1016/j.foreco.2013.08.007....Click for the full abstract. Fire has a profound, though paradoxical influence on landscapes of the southeastern U.S.; it simultaneously maintains native biodiversity and ecosystem processes but also threatens silvicultural resources and human landscapes. Furthermore, since the majority of the southern landscape is heavily influenced by human activities, contemporary fire regimes are human managed disturbances within extant fire-dependent ecosystems. Though there is considerable uncertainty in climate projections for the southeastern U.S., climate change will likely impact both prescribed fire and wildfire. In this review, we synthesize climate change-fire interactions, discuss the impacts of uncertainty in a human-dominated landscape, and illuminate how both climate change projections and their uncertainties might impact our ability to manage forests in the Southeast. We define the Southeast region as consisting of the Gulf Coastal Plain, Lower Atlantic Coastal Plain, Piedmont and southern Appalachians and associated subregions. This region has the greatest area burned by prescribed fire, the highest number of wildfires in the continental U.S. and contains globally significant hotspots of biodiversity, much of which is dependent on frequent fire. The use of prescribed fire as a management tool depends on a suite of weather and fuel conditions which are affected by climate. Over the next five decades, general circulation models (GCMs) consistently predict air temperature to increase by 1.5–3 °C in the Southeast. Precipitation forecasts are more uncertain with respect to the mean; but, most models predict an increase in precipitation variability. Increases in the likelihood of severe droughts may increase wildfire occurrence while simultaneously limiting the implementation of prescribed burning by restricting the number of days within current prescription guidelines. Mitchell, Robert J., Yongqiang Liu, Joseph J. O’Brien, Katherine J. Elliott, Gregory Starr, Chelcy Ford Miniat, and J. Kevin Hiers. "Future climate and fire interactions in the southeastern region of the United States." Forest Ecology and Management (2014). DOI: 10.1016/j.foreco.2013.12.003 Click here for the full abstract. My home state of Victoria is, like California, one of the worst areas in the world for wildfire. We call them "bushfires" here. As climate change gets worse, so will the fire danger in my part of the world. By all accounts the same thing will happen in the western USA. There are a lot of comments, some quite confusing. One thing is clear - many of the people commenting didn't get the message that Anthony was trying to convey. The comments also reminded me that when it comes to fires, they are all the fault of the "evil greenies". If it were left up to the free marketers, the guvmint would have taken over all the state forests, national parks, forests and farms, bulldozed all the trees and laid concrete from one end of the USA to the other. That would stop the wildfires. Because of the environmentalists’ constant meddling with well-established practices of regular forest / bush burnoffs, we get more fires that are larger and harder to contain because of an abundance in fuel. Then they turn around and say that we get more fires because of climate change. Since CO2 results in more plant growth, I would have expected higher CO2 levels to result in more and bigger fires. All other things being equal, which they never are. I noticed that nearly all these big fires occurred at sometime after Aug 1. Why do they choose this ending date when most fires, at least in my area of Cal. happen later in the fire season. We have had a number of moderate fires this year, but without the hoped for El Niño, I suspect our biggest fire this year is yet to come. OK…. but the number of large fires (over 1,000 acres) has risen since 1984, and the fire season has lengthened from 5 to 7 months. I’m glad fires are down, but it looks like you’re cherry-picking data here, Anthony. Not to mention the misleading headline… climate models do not predict forest fires. How many of these are susceptible to fire? This means there is less to burn and as a % of remaining forests the value will be increased. The plots should be of % of available burnable areas not a fixed area. When 100% is burned then presumably watts can crow how the forest fires have dropped to zero. Actually plotted this -the.% burnt / year slope changes from 0.027 to 0.034%/year (not a lot!! but the thought is valid!) this assumes all forest is likely to combust. A lot of the answers to your questions vary from region to region. Most of the country from the Rockies west is very susceptible to fire, but fires can occur anywhere, ie. there have been major fires in FL over the last few years and Alaska had a monster fire earlier this year. Frequency of burn varies with ecosystem type. In southern California the historical return interval was about 5 years in the coastal sage scrub are where most of the development is. In the northern Rockies stand replacing fires occur about every 250 years. Grasses, brush and saplings will very quickly provide a new burnable ground cover, which points up the importance of knowing what has burned in a given fire. As RN notes, a fire that burns over recently-burned areas or other scrubland is a quite different proposition from one that burns big trees stands. Landscape type conversion via increased fire is a serious concern as climate changes in the Southwest, but I'm not aware of any relevant statistics. Of course, his being able to do some meaningful maths helps a lot. Topical. Basically just a teaser for now, but hopefully we'll be able to see the data before too long.